Air travelers' identities are checked in various ways before they are able to fly. How was bombing suspect able to board a flight despite being on no-fly list? (CNN) -- The no-fly list is supposed to help keep terrorists off planes, so when the Times Square car bombing suspect was able to board a flight anyway, it put the process under immense scrutiny. The government has already made changes to the system. On Wednesday, it began telling airlines to check updated no-fly lists within two hours of the time they are issued, not within 24 hours, as under the previous directive. It happened after Faisal Shahzad, a 30-year-old naturalized U.S. citizen from Pakistan, was arrested at New York's John F. Kennedy International Airport late Monday after boarding a flight bound for Dubai, United Arab Emirates. His name had been put on an updated no-fly list, which identifies people who pose a credible threat to aviation security, earlier in the day. Shahzad made his reservation by phone as he drove to the airport just hours before the flight, investigators said. When he paid for his ticket in cash at the ticket counter, the airline had not refreshed its no-fly information, so his name did not raise any red flags, a senior counterterrorism official said. Emirates, the airline that sold Shahzad the ticket, said it followed all the rules. "Emirates is in full compliance with all passenger check-in procedures in the U.S. and works closely with both the Transport Security Administration (TSA) and the U.S. Customs and Border Protection (CBP) agencies to update security watch lists on a regular and timely basis," the airline said in a statement. The incident appeared to be "the quirk of time" for which backup measures exist, said Frances Townsend, a CNN national security contributor and homeland security adviser to President George W. Bush. For such cases, the system was designed to include "necessary and built-in redundancy," White House Press Secretary Robert Gibbs said during a briefing. If a name is added to the no-fly list and an airline misses it, U.S. Customs and Border Protection can look at a flight's final passenger manifest and identify anything that a carrier may have overlooked, Gibbs said. To understand how the process works, air travelers should know that there are actually several lists airlines check, some of which may overlap. 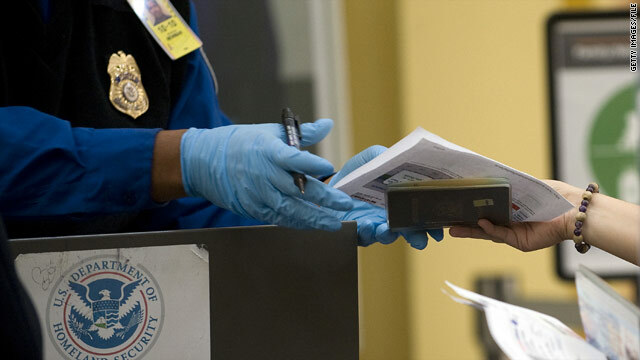 There is the main no-fly list, whose purpose is straightforward: to keep known terrorists off planes, according to the Transportation Security Administration. The no-fly list, maintained by the National Counterterrorism Center, contains thousands of names, and it ballooned after the failed bombing of a U.S.-bound jetliner December 25, Townsend said. There are also several much larger watch lists maintained by various government agencies that may focus on people who have overstayed their U.S. visas or are flagged because there's concern about their affiliations, Townsend said. Some of those lists may have hundreds of thousands of names. When you buy a seat on a plane in advance using a credit card, which is how most people purchase their tickets, your name will be put "through a scrub" -- checked against the lists -- 24 hours before your flight, Townsend said. There's another check when you get your boarding pass, which may alert the gate agent to a possible problem. Then, about an hour or so before the plane takes off, the National Targeting Center, run by U.S. Customs and Border Protection, gets the final passenger list. This is how Shahzad's name was finally flagged. "That's why you have a secondary system with the National Targeting Center, so if something like that should happen, there's a second opportunity for the government to catch this, which is exactly what did happen," Townsend said. "They now have that manifest of the actual people who not only bought with credit cards but have walked up and bought [a ticket] at the last minute. They have all those names, and they do a second scrub," she said. The National Targeting Center was established in October 2001 in direct response to the September 11 terrorist attacks, according to the U.S. Customs and Border Protection website. Meanwhile, there have been questions about why it's up to the airlines, not the government, to check the no-fly list. The main issue is that the airlines have all the necessary passenger data, so they either have to perform the check themselves or send the data to the government, a costly proposition, Townsend said. She believes that the government will ultimately end up doing the checks in the long run. CNN Wire staff contributed to this report.